For forced aspirated cars, intercooling is one of the most vital considerations. In fact, after ensuring that you get plenty of boost over as wide an engine load range as possible, and there’s the right fuel and (in petrol engines) ignition timing, intercooling is the key to making power. That applies whether you’re talking an Impreza WRX, Falcon XR6 Turbo – or a diesel passenger car. But in other respects, diesels are different. Simply, the intercooling approach that works on a high performance petrol engine car does not necessarily work on a diesel turbo. Let’s take a look. Intercooling approaches can be divided into two basic types – air/air intercooling and water/air intercooling. Air/air intercoolers are the most common type of intercooler, both in factory forced induction cars and aftermarket. They are technically simple, rugged and reliable. 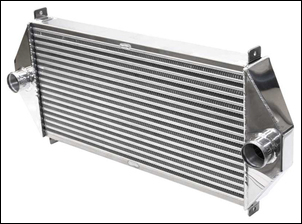 An air/air intercooler consists of a tube and fin - or bar and plate - radiator. The induction air passes through thin rectangular cross-section tubes that are stacked on top of the other. Often inside the tubes are fins that are designed to create turbulence and so improve heat exchange. Between the tubes are more fins, usually bent in a zig-zag formation. Invariably, air/air intercoolers are constructed from aluminium. The induction air flows through the many tubes. The air is then exposed to a very large surface area of conductive aluminium that absorbs and transfers the heat through the thickness of metal. Outside air - driven through the core by the forward motion of the car - takes this heat away, transferring it from the intake air to the atmosphere. In the absence of any other description, an ‘intercooler’ is an air/air design. 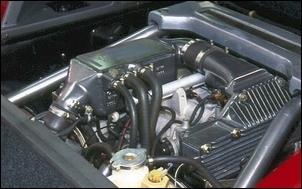 A water/air intercooler uses a compact heat exchanger located under the bonnet and normally placed in-line with the compressor-to-intake-manifold path. The heat is transferred to water which is then pumped through a dedicated front-mounted radiator cooled by the airflow generated by the car's movement. An air/air design is cheap (these days, with the advent of eBay cores, very cheap) and simple. In many applications a large core can be used and the only real difficulty is getting plumbing to and from the core. However, in some cars that can be hard indeed! A water/air intercooler has some distinct cooling advantages on road cars. Water has a much higher specific heat value than air. The 'specific heat value' figure shows how much energy a substance can absorb for each degree temp it rises by. A substance good at absorbing energy has a high specific heat value, while one that gets hot quickly has a low specific heat. Something with a high specific heat value can obviously absorb (and then later get rid of) lots of energy - good for cooling down the air. A water/air design has the potential to have a much bigger heat sink effect (more on this in a moment) and so can cope with temperature spikes very well. Getting the small diameter water hoses to the front-mounted radiator is usually a lot easier than getting the large diameter tubes associated with an air/air intercooler to the front of the car. However, a water/air system is more complex, more expensive and often heavier than an air/air design. In most petrol car applications, intercoolers work more as heat sinks than as radiators. That is, they seldom – if ever – shed the heat at the same rate as it is being absorbed. So instead of thinking of an intercooler as being like the engine coolant radiator at the front of the car, it's far better to think of it as being like a heatsink inside a big sound system power amplifier. If an electric fan cools the amplifier heatsink, you're even closer to the mark. Audio output power spikes generate heat that's dumped into the amplifier's heatsink to then dissipate to the air over a relatively long period. This means that the heatsink does not have to get rid of the heat at the same rate at which it is being absorbed. Now, take the case of a turbo road car. 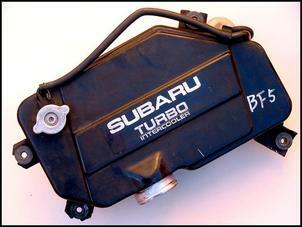 Most of the time in petrol engine turbo road cars there's no boost occurring. In fact, even when you're driving hard, by the time you take into account braking times, gear-change times, trailing throttle and so on, the 'on-full-boost' time is still likely to be less than fifty percent. In normal highway or urban driving, the 'on-full-boost' time is likely to be something less than 5 per cent! So the intercooler temperature (note: not the intake air temp, but the temp of the intercooler itself) is fairly close to ambient most of the time. You put your boot into it for a typical quick spurt, and the temperature of the air coming out of the turbo compressor rockets from (say) 40 degrees C to 100 degrees C. However, after it's passed through the intercooler, this air temp has dropped to (say) 55 degrees. Where's all the heat gone? However, there’s a very important point to note. This sequence of events applies only to cars where turbo boost events are relatively rare. 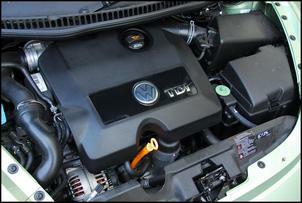 Turbo diesel road cars are on boost far more than an equivalent petrol engine car. In fact, because the off-boost airflow of a diesel doesn’t vary with load, there’s potentially enough exhaust flow to keep a turbo boosting even when the driver has their foot off the accelerator on the over-run! And a diesel turbo that runs 2 or 3 psi boost in normal highway cruise is common. There are two reasons for this differing behaviour – a diesel doesn’t use a throttle and so the airflow generated by the turbo is not artificially reduced; and because diesels are intrinsically less powerful for their capacity than petrol engines, to make up for that power deficit, the turbo is usually sized to work harder more of the time. In addition to being on boost a far higher proportion of driving time, diesels generally use higher boost figures than petrol engine cars. And irrespective of whether the car is under load or not, the air temperature exiting the turbo depends on how much it has been compressed, that is, its boost pressure. Higher equals hotter. This combination of factors – higher boost used more often – results in different intercooler demands. In short, a diesel intercooler has to work far more at ‘real time’ removal of heat rather than acting as a heatsink. So what implications does this have? In a diesel, heat soak becomes a huge problem. Take an intercooler that’s mounted under the bonnet, as many factory diesel intercoolers are. The car is driven and then parked. The underbonnet environment then gets hot – much hotter than when the car was running and there was airflow through the engine bay, and (separately) through the intercooler. In fact, on a hot day, it’s not hard for a heat-soaked intercooler to be at 70 degrees C.
The car is started and driven off. Because it’s a diesel, straightaway it’s likely to be on boost – and plenty of it. So air is exiting the turbo at (say) 100 degrees C and then passing through an intercooler that’s at (say) 70 degrees C. As can be seen by the relativity of these figures, the intercooler will still drop the temp of the induction air, but only by a small amount. The result is hot induction air entering the engine, resulting in poorer power, fuel economy and throttle response. Now here’s where it starts getting really interesting. In most cars, an intercooler with a high heat sink capability is a good thing – it allows the intercooler to knock off the temp spikes caused by short-term high boost events. 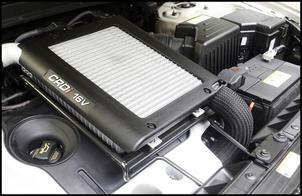 But if the heat-soaked intercooler has a high heat-sink capability, it will stay hot for longer. So for example, an underbonnet water/air design, which has a high thermal mass (water has a very high ability to absorb heat, or to put this another way, stay hot once it is hot!) will have poor effectiveness as an intercooler for quite some time after a hot car has been re-started. That’s just the same as for a water/air intercooler under the bonnet of a petrol turbo car. Measured intake air temps on a factory water/air intercooled Subaru Liberty RS shows that intake air temps remain high for some time after a hot car has been restarted. But in the petrol turbo car, boost is used less and is lower in level, so allowing time for the water/air heatsink to drop in temp after driving off. Because boost is used far more often in a diesel, the intercooler has to be designed to be effective at real-time heat transfer to the atmosphere, rather than storing the big spikes for later, slower dissipation. This means the intercooler efficiency must be higher – much higher than in a petrol turbo car. And because a turbo diesel can generate high boost pressures at low road speeds, forced air cooling (eg by fans) is needed far more often than it is in a petrol engine car. At a given boost pressure, a diesel has equal airflow at one-tenth full load, half full load, and full load. In other words, diesel airflows are on average considerably higher than are experienced in a petrol engine car of the same capacity. This has major implications for intercooler sizing. If the intercooler causes a pressure drop (ie has a flow restriction), not only will top-end power suffer but, through the increased pumping losses, cruise fuel economy may also be affected. Because of their small cylinder clearance volumes (ie high compression ratios), diesels are very susceptible to engine damage if they ingest water. This has implications for water/air intercooler designs – any internal water leak could quickly prove catastrophic. So where does all this lead us for diesels? An underbonnet intercooler should not have a high heat-sink capability. That is, its thermal mass should be low. This has significance for water/air systems that place a large volume of water (eg 1 or 2 litres) in the heat exchanger. It also implies that air/air intercoolers should be physically light. Water/air systems can benefit from a large volume of stored water, if that water is stored in location that does not heat soak when the car is stopped. In addition to having low thermal mass, underbonnet intercoolers should have forced air fan cooling to enable very quick temperature reduction after restarting a hot car. This is also advantageous in low speed / high load conditions. Intercoolers should have a very high internal airflow capacity. For example, for the same intercooler size, an air/air intercooler with a small number of long tubes will have a greater flow restriction than an intercooler with a large number of shorter tubes. It’s easy to look just at the power figure of a turbo diesel and assume that little intercooling capacity is needed. In fact, view the intercoolers of some factory turbo diesels and you could certainly think that! However, because more boost is used much more often, intercooling a diesel turbo requires much better design than an equivalently sized petrol turbo engine.